Offshore rig companies are ungodly cheap right now. Are their low valuations worth the risk? A lot of companies have been hit hard by the slide in oil and gas prices, but few have been as affected as offshore rig companies. In fact, just about every major player in this industry is selling for dirt-cheap valuations that would make even the most ardent value investor blush. Do these unbelievably low valuations suggest that it's time to buy these stocks? Let's see why Wall Street is so sour on these companies and whether those who look beyond the market's short-term focus can take advantage of these undervalued stocks. These stocks are very cheap. Probably the most telling of these valuation metrics is price to tangible book value, and here is why. Price-to-earnings and enterprise value-to-EBITDA metrics are based on results for the past 12 months and comparing to what investors currently think of the stocks. Over the past several months, these companies have been able to maintain their EBITDA results rather well over the past year, thanks to cost savings and scrapping older rigs that have passed their economic lives. Those two valuation metrics don't reflect the fact, though, that most of these companies have lost some business as rigs have gone off contract and there has been little to no new work for them. Price to tangible book value, though, is a better reflection of the future earnings potential of these companies. Basically, the market is saying that if all of these companies were to liquidate today, their assets -- after all debts are paid -- are worth $0.30 on the dollar or less. If one or two companies within the industry were trading at this low of a valuation, that might make sense. It would be a reflection that the market is anticipating some of the weaker players to get weeded out. For five of the largest offshore rig owners to all be selling at this price, though, it seems that Wall Street thinks this entire offshore rig market is doomed. 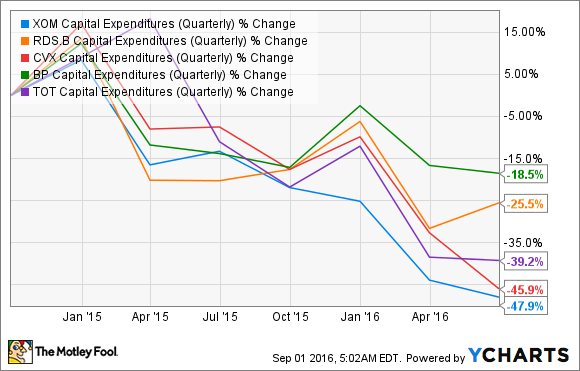 XOM Capital Expenditures (Quarterly) data by YCharts. These are five of the largest customers for rig companies, and their rapid pullback in capital spending means there isn't a whole lot of work lined up in the future. For this trend to reverse, two things need to happen: (1) Oil prices need to rise, and (2) These companies -- and others -- need to repair the damage this industry downturn has taken on their balance sheets. 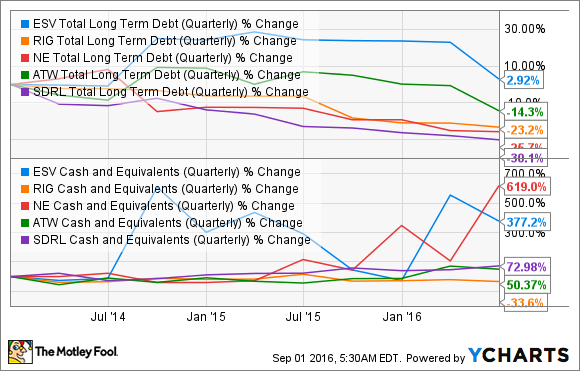 XOM Debt to Capital (Quarterly) data by YCharts. When that happens, producers will be a little more willing to open their wallets and spend on new production sources. This could be another hurdle, though, because in the past few years a new, cheaper oil source has been developed: shale. As producers have become better at understanding how to extract oil and gas from shale, the costs have declined rapidly and made what was once a token oil source into one of the most economically viable sources out there. Chevron (NYSE:CVX) and ExonMobill (NYSE:XOM) have already hinted in their investor presentations that spending on shale will take up a larger portion of their capital spending in the future, and that will likely come at the expense of offshore work. It is apparent that the next year or two could be absolutely brutal for offshore rig companies. There is the lack of contract issue to deal with, but some of these companies are still on the hook to pay for new rigs that are currently under construction. Finding the cash to pay for them will be hard to come by. The one thing that should give investors a little hope that players in this industry will get through this is that many of them have been building up cash piles and/or paying down debt as they anticipate the tough times ahead. ESV Total Long-Term Debt (Quarterly) data by YCharts. These companies probably have a few more quarters of robust-enough cash flows to pay down more debt and build cash until contract roll-offs sink their teeth into earnings, so these balance sheets could improve a bit more. There is no denying that there is a lot of risk involved in these companies. We don't know how much longer the downturn in offshore drilling activity will continue, and there is a chance that a couple of these companies will be headed toward the b-word. At the same time, however, some of the five companies listed here are likely to make it through to the other side. 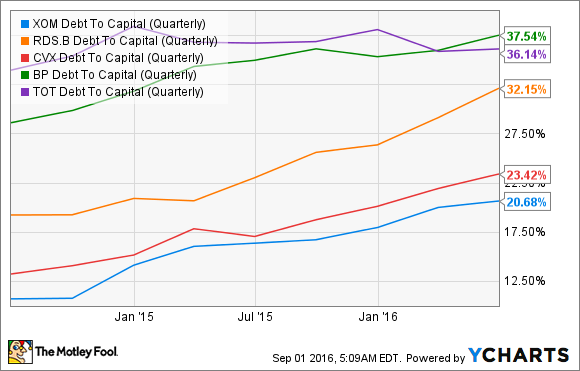 At these incredibly cheap valuations, a very patient investor could reap some large gains.